should you do what you love? – Love. Life. Practice. It became a mantra: ”Do what you love. 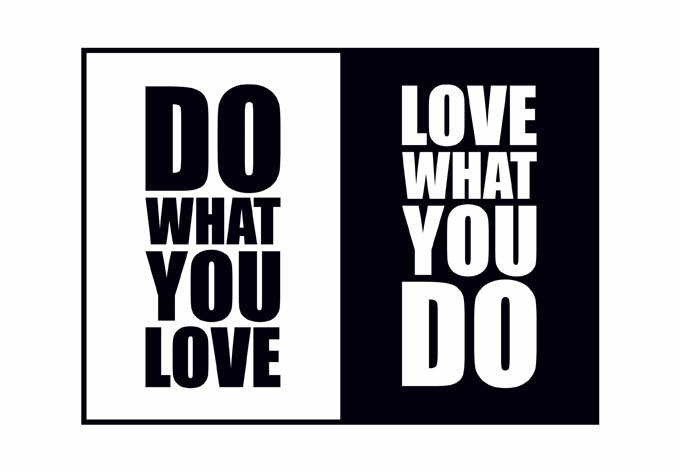 Love what you do.” Or, “Do what you love, and the money will follow.” Or the idea that “If you love your job, you’ll never work a day in your life.” Many books were written on it. I also coached many people towards it (you know who you are) and it could be said that my current career path has been something of a “path of love”, or at least of passion. The last time I worked for someone as an actual employee my job was to create web pages making really bad time-shares look really good. “Turd-polishing” was the unofficial job description I gave it, and I walked out one Sunday and never looked back. Barbara Sher and Tim Ferriss also have bestsellers about doing what you love that are slightly more pragmatic, where they suggest that you first find some job that pays the bills and subsidizes your dream. Still, their message is clear: What you love is important. I have to point out that many people who did what they didn’t love and what they were told would pay are also being overworked, underpaid, and let go at a moment’s notice. It brings to mind a bit from the movie The Commitments, when two band members are standing in the dole (the U.K. welfare line). “How yeh doin’?” the band manager asks. “Who am I?’ and ‘What do I truly love?’—are essentially impossible to confirm. ‘Is this who I really am?’ and ‘Do I love this?’ rarely reduce to clear yes-or-no responses. In other words, the passion mindset is almost guaranteed to keep you perpetually unhappy and confused. . .
I’ve read his book, and I confess I was pretty disappointed. The idea that you should find work that makes money and just keep doing it until you love it seems to me just as silly as the idea that your passion for baseball cards will make you a million. It’s similar to an arranged marriage…then again, statistically, arranged marriages actually tend to stay together longer. I think there’s more to the whole idea than some Yoda-esque “do. or do not.” There is more, if you’ll pardon the term, gray area to the subject. It depends on how you look at it. I choose to think of the first “Do what you love” as a call to remember that your passions have value. They deserve attention. Make time for them, because as Gary Vaynerchuk said, at the end of your life you probably won’t wish you’d spent more time not doing them. 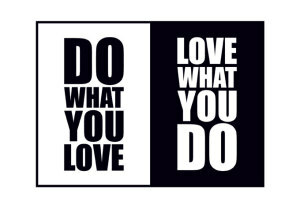 And “love what you do”? That can be a call to mindfulness, to finding the value of your work (more on that Monday). You absolutely should not do what you hate.